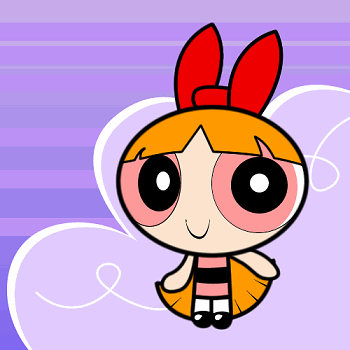 Bored at work, one day, I drew this picture of Blossom in Macromedia Fireworks. This was before I found out how good Macromedia Flash was. This was also my first attempt at drawinga background. I based it on the backdrop of my desktop, it came out well.. but blossom looks a little off... Fireworks rounds the lines off too much, I couldn't find out a way to have sharp corners easily, and the lines around the eyes are too thin. This is in the abandoned section because I don't really like it, I don't think I'll ever use Firworks for this sort of drawing again. All the outlines are just wrong!